I have another out of town friend staying with me this weekend, so you know what that means, I need to stash all my polishes in my kitchen hidey spots again. Hopefully I'll remember where I put them all. I guess it's not a bad thing that I won't be doing any swatching this weekend because I had a big break on my middle finger today so I need to let it grow out a bit. 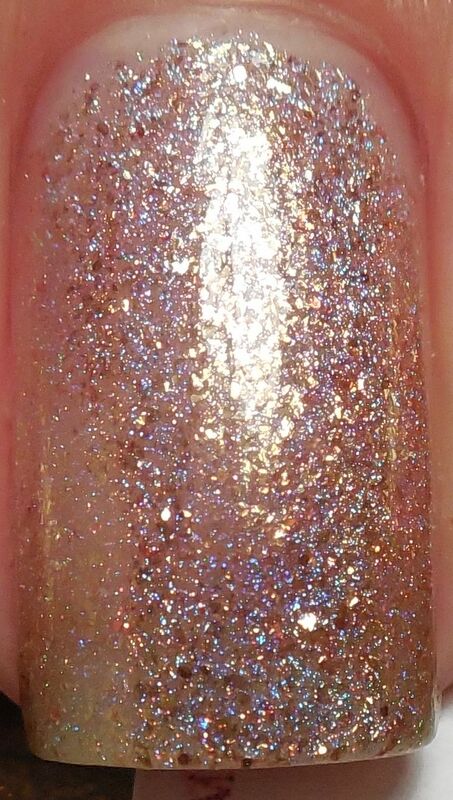 Tonight I have my first Enchanted Polish for you, and that's Austin Powers, a lovely golden beige flakey holo. I love how delicate this polish looks and it makes a nice palette cleanser. The scattered holo gives this polish a nice kick and the flakes give it some extra sparkle. I used two layers in these pics and found the formula to be very sheer and slightly watery, but still easy to apply. No topcoat because I didn't want the possibility of dimming the holo. I really adore the flakes in this, it reminds me of the China Glaze Kaleidoscopes but I have to admit that I was disappointed in the shade of it against my skintone. I wonder if it might pop more against a darker base. Have you tried any polishes by Enchanted Polish, and if so, which is your favorite?